Holidays to Bohol, and Bohol Tours in the Philippines. A Bohol tour or holiday is to experience one of the most popular and picturesque islands of the Philippines. Bohol is situated in the central part of the country, a region known as the Visayas. The island of Bohol offers numerous natural attractions such as the Chocolate Hills, the Loboc River, and wildlife including the Tarsier, the smallest primate in the world. 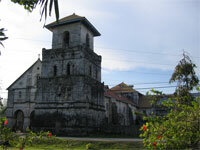 Our Bohol Countryside Tours let you explore these popular tourist attractions. Book a holiday with a Bohol Countryside Tour included. Many of our Tour Suggestions include Bohol. Bohol in a nutshell is a little bit of Cebu, Palawan and Boracay rolled into one, with rich history and Spanish heritage, lush flora and unusual fauna, and white sandy beaches. But make no mistake - Bohol has a unique local flavour unseen in any other part of the Philippines. Throw these all into the mix, and Bohol is one great holiday destination. 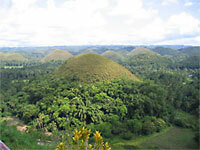 The Chocolate Hills are one of Bohol's most famous landmarks, and look like giant mole hills. Indeed, they are one of the most important visitor attractions in the whole of the Philippines. They are very uniform in shape and are covered with grass, which, at the end of the dry season, turns chocolate brown, which gives them their name. The Bohol Countryside Tour also takes in the Man-Made Forest, Butterfly Farm, Blood-Compact Marker, Hanging Bridge, plus historic landmarks and buildings, such as the Baclayon Church. 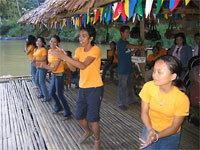 Take a cruise on the Loboc River, complete with unique entertainment from local musicians, with dancers, skipping over long bamboo poles. This is "tinikling" - the national dance of the Philippines! Keep an eye out for the dazzling colours of kingfishers too. On the Bohol Countryside Tour you'll also get to see the Philippine Tarsier - one of the smallest known primates. Although a protected species, it is still threatened by the destruction of its natural forest environment. You can visit the tarsier at the Philippine Tarsier Foundation, to see it in its natural habitat. Rajah Sikatuna National Park is the widest remaining forest in Bohol. It is a haven for nature lovers and bird-watchers. Numerous species of birds, butterflies, flora and fauna can be found and there are many paths for visitors wish to trek or go birding in Bohol. Tarsiers, which are mainly nocturnal, and monkeys can be found in the woodlands within the park. There are also 26 species of bat, some living in limestone karst caves. The park also contains a butterfly sanctuary, known as the Simply Butterflies Conservation Centre. If you'd like to include Bohol trekking or birding in your Philippines tour, let us know. Panglao Island is connected to Bohol by a short road bridge, and it is on Panglao Island that tourists and visitors are mainly accommodated. There are a number of beautiful sandy beaches, and the standard of hotels and resorts range from eco-friendly experiences up to five-star luxury. By taking a Panglao Island Tour, you can visit Dauis Church and Watch Tower, experience the unique Bee Farm organic farming resort, or take a tour of a Coconut Plantation. 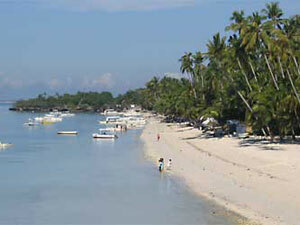 Bohol is a great island for holidays and tours, with Panglao Island as the place to stay. Take an early morning banca ride to watch whales and dolphins in the Bohol Sea with the local boatmen of Pamilacan Island. Ex-whale-hunting boats have now been converted for this activity, as tourism becomes an important part of the local economy. You'll be accompanied by skilled local spotters whose familiarity with the area also makes them excellent guides. These locals are descended from whale hunters, although now they simply search to let you have sight of the magnificent wildlife that frequents these waters. A stop-off on Pamilacan island follows, where you can explore the villages, meet the locals, enjoy a freshly prepared lunch, and maybe have a swim or relax with a massage on the beach. On nearby Balicasag Island, swimming & snorkeling may also be enjoyed. Dolphin & whale watching tours can be combined with other Bohol Tours.